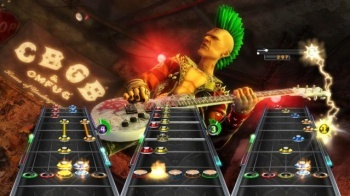 Guitar Hero franchise could have been handled better, says Activision's chief financial officer. Despite the franchise being on hiatus at the moment, Activision's Thomas Tippl says that there is still a lot of love among gamers for Guitar Hero. He does admit however, that mistakes were made with the franchise, and that Activision has lessons to learn. "Guitar Hero probably didn't receive the amount of nurturing and care that it needed to maintain [its] position [as a top-selling franchise]," Tippl said. He added that certain franchise elements, as well as Activision's relationship with music providers had caused problems, and that if and when the publisher brought the franchise back, it would have to take all of this into account. While it's undeniable that Activision helped to make Guitar Hero a massive success, it was also widely blamed for running the entire music game genre into the ground by saturating the market with later, lower-quality Guitar Hero updates. If Activision does bring the series back, it's going to have to adopt a pretty different business model. Personally, I'd like to see fewer boxed releases - maybe one every couple of years, if that - and much greater online support. A unified music library - perhaps even including downloads for legacy games - wouldn't hurt either.